Although I really liked Ice Age 4 I have been hoping ever since I saw the first movie that they would make a sequel where they meet 'Pinky' again. Needless to say they didn't. So these are just some sketches of what should have happened. You know they could always do what Disney did with the Lion King and make a 1 1/2, a story between the first and second movies. It's always nice to get comments. And I cherish each of them. But please...please don't swear in them. I hope they do meet Pinky again! That'd be so adorable! I'm really hope that Blue Sky makes a short/special that involves the Ice Age Gang encountering Roshan again (yes that's the human's name). It would be a satisfying answer for the audience in my opinion. My boyfriend was scrolling through his Facebook page with me at his side, and suddenly this picture appeared. At first I just looked at it, not really understanding, and then it made sense all of a sudden. I said "S**t" and I tried, really tried to keep on going, but something was wrong. I just hid my face on his shoulder and started crying like I had seen Mufasa's death again (yes, I keep crying on that scene). My boyfriend didn't expect that, and he couldn't help but laugh while he hugged me and patted me in the back. I even started coughing because of the tears. Something hit me right in the heart about this image. I don't know if it was because this movie was part of my childhood or what, but it hit me. You, chill13 , are the most awesome and freaking gifted person ever. I will love this drawing forever. Awww! It's not everyday an artist gets to hear a story like this. Thank you for sharing. I'm so glad that it was able to touch you. I drew this shortly after the first movie came out. I wanted a sequel and I wanted it to be something like this. I've always wanted to see them bring Roshan back. Each time they make a sequel there's a little part in my heart that hopes. But it seems that is not in the producers plans. So that is what fanart is for. My head story is that Manny and Sid are attacked by a group of young human hunters. Diego comes to the rescue and the boys scatter and he takes after one of them. He tackles the kid, pinning him to the ground. The young human's face turns from terror to confusion and then to recognition. Diego, completely baffled by this reaction takes his paw off and steps back. The boy sits up but doesn't run, he just stares for a long moment. Slowly he reaches up, puts his hands over his eyes and pulls them back in the 'where's the baby' motion. Ha Ha! So glad you like!! one thing that gets me mad is that in ice age 5 the UFO that was in the original ice age, was featured in the 5th one which tells me that the developers know about the whole Pinky situation but wont make a reunion. Yep. They are aware of the situation. They just don't wanna. Saw this on my facebook homepage. Went looking for its source, and I found it. It's amazing! Would love to see it on screen! Maybe a fan-made video on traditional animation? Just saying Awesome. Aw! Thank you so much for taking the time to find out where it came from! That means so much to me! I really think this is the direction they should have gone with at least ONE of the sequels. It would have been cute. Now I'm wishing they made a movie like this. Hey chill13 I saw this ages ago like years ago but still think its spectacular I saw we need to make this a reality with the power of fans and making this viral DO YOU AGREE WE NEED TO DISCOVER A WAY TO GET THIS TO BLUE SKY STUDIOS ITS POSSIBLE U SHOULD POST THIS TO www.iceagemovies.com/drawings?… and submit all your roshan artwork!!! WE CAN DO THIS WHOSE WITH ME ICE AGE FANS ON MAKING THIS A REALITY!!!!!!!! Wouldn't it be great. I really think it would make a good story. I thought it would be interesting if he was actually hunting them and Diego attacks in retaliation and gets him down on the ground and his eyes get all big and they both recognize each other at once. Roshan sits up and 'peekaboos'. 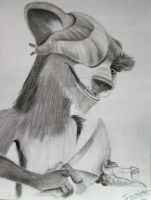 you should make more of these like make an an actual picture not a sketch, but add the whole herd that are in ice age 5 there, while add it where roshan has his tribe with him. I may do that one day. I completely agree. The first movie, even though it was kind of silly felt like it could happen. It had it's nice quiet moments that touched the heart while still being funny and quirky. After that....well, they just weren't as good. Yeah. I doubt they would bring him back. Sadly. I'm not quite so sure as elephants have different growing rates than humans. Elephants reach adulthood at about 10. So technically, if she is a 'teen' she's probably around seven years old. However we don't know how much time passed between the first and second films. So you could still be right. Wow...I never thought of that! You could be right. Hope so. But with the migrating and the continental drift they've come so far physically from where they met the people it would be quite the miracle to find them again. We need to find an alternate dimension where this was the first sequel.